By: Kathy Anderson and Michelle Mignot, Courtesy of the National Association of Colleges and Employers. LinkedIn, Pinterest, websites, blogs, and other social media and networking tools—far beyond the traditional paper format. Recruiters, HR managers, and employers in general are overwhelmed by record numbers of resumes in response to job postings; in fact, studies show that hiring managers spend less than 6 seconds reviewing a resume. Many of the resumes that employers receive look alike and are full of the current buzzwords. The traditional resume is a flat presentation of the student in a 3-D world, and for some jobs, the traditional resume just doesn’t cut it anymore. In addition, students and new grads are searching for jobs in new ways, using LinkedIn and social networking, and employers are searching for talent on these platforms. To get your resume read and have a recruiter respond demands a competitive edge using contemporary tools. Cooperative education coordinators working at Drexel University helping students find co-op jobs in their industries, watched students submit traditional resumes to companies they longed to work for-powerhouses like Pixar, Nickelodeon Studios, and Marvel Entertainment. Lost among so many other applicants, the students frequently got no responses and no interviews. So, career services professionals started looking for solutions and a new approach to the traditional resume. The “rules” of resumes demanded a uniform style and content, ignoring the revolution created by technological changes and the entire world of social media tools. This inadvertently created a credibility gap with both students and employers who were already users of the technology and tools. That conclusion lead to a whole universe full of new approaches and fresh ideas. For example, resumes of students in digital media needed to show off their design skills or their expertise with the software that they would use on the job. Students were encouraged to brand and market themselves using the same tools that they would use on the job-animation, graphics, movement, design. And the new approach worked. 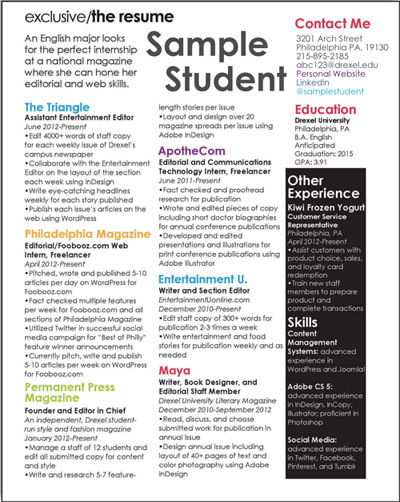 Drexel students produced a wide variety of resume styles that reflected their skills as well as their design styles. One student landed his dream job at Nickelodeon Studios by showcasing his personal branding across his resume, website, and demo reel. A screenwriting/playwriting major wrote her resume in screenwriting format, with chapter headings instead of traditional resume headings. She landed a rare paid film industry co-op job in Los Angeles. A product design student used a streamlined and highly styled approach to land not one but two competitive placements with New York fashion houses. A film/ video major who loved the horror genre added a fun horror graphic to her resume and got a job at a science fiction television channel. Interestingly, the response from engineering, business, and computer and related technical students was enthusiastic, proving that creative resumes are not the sole province of graphic design and digital media majors. There are so many simple and effective techniques that the other majors were able to grasp quickly and run with that. The 21st century resume was useful across a variety of fields and industries. And, the (mostly) simple techniques showed that this resume is achievable for anyone with basic Word skills. Color jumps off the page and can be as simple as a header, an underline, or highlighted text. Graphics can convey tone, humor, and skill, as well as add to personal branding. Unique fonts can help the information stand out from the crowd. Text boxes can be a great way to highlight a lot of information in an attractive way, for example, long lists of software. Columns are a simple trick to break the full-page one-column monotony. Personal traits can show employers more than the flat one-dimensional picture. Style related to a specific industry will highlight a deep understanding and ability to tailor a message. Social media shows creative thinking and demonstrates social media fluency. Business or marketing major: Link to a sample business or marketing plan. 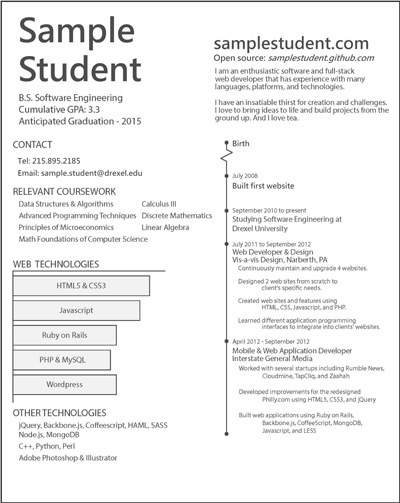 Computer sciences major: Link to his or her open-source coding projects. Engineering major: Link to a prizewinning robotics team design and video. English major: Link to his or her blog or website with writing samples. Fashion design major: Link to a Pinterest content sharing page to showcase designs and influences. Graphic design major: Link to his or her online portfolio. Film/video major: Link to a demo reel, YouTube channel, or website. Since many employers now rely on LinkedIn profiles to get more information about a potential employee, you are encouraged to create and expand your LinkedIn profile and link to it in your e-mail signature and on your resume. The LinkedIn format allows you to show off your skills, honors, awards, connections, projects, recommendations, portfolio samples, and more. Although new resume styles include the use of such elements as infographics and video, and can be posted on LinkedIn, Pinterest, and Facebook, these resumes are not for every student and every job application. Your LinkedIn profile can actually turn into a resume through its resume builder function. You can customize the content, and then share resumes through LinkedIn, Facebook, Twitter, and other social networking tools. When needed, the LinkedIn resume can be made into a PDF and e-mailed. An infographic resume is a visual explanation of skills, experience, and more. As a graphic, it integrates words and pictures in a fluid, dynamic way, is completely self-explanatory, and is universally understandable. The infographic resume can convey a large amount of information about you as a potential job candidate in a unique and effective way. A video resume is a way to show off your creative skills and also to give you an opportunity to deliver your “30-second commercial” about yourself to an employer. It’s as if your flat resume stood up and started talking to the hiring manager. Pinterest can be used to showcase your unique skills and tastes. Imagine the interior design major who uses the content sharing “pins” to highlight their designs, point to their inspirations, and show off their industry knowledge and goals-all using photographs and illustrations. Now think of the employers who are hungry to find that good fit to their design aesthetic and you can see how a targeted Pinterest site can help a student pin down a great job. How Do You Know When It’s the Right Style? Nontraditional resumes are not suitable for every application. When you research a company’s website, social media, and Internet presence, you should assess the branding of the company to see if a creative resume is a good fit. If the HR department head’s title is “Chief People Wrangler,” chances are good that the company would welcome a quirky, individualized creative resume. If the job description is written in a casual, fun style that urges applicants to show off their individuality as well as their skills and experience, it’s a green light for the 21st century resume. Other places to check out include the company execs’ biographies, company pages, Twitter feeds, and other social media to get a sense of the corporate culture. You can also ask for advice from faculty and industry contacts on whether to submit a creative resume to a particular company. If you choose a newer approach to a field like medicine or banking, there’s a chance that it may be welcomed enthusiastically by the employer. For example, an employer from a museum said he’d love to see a creative approach from more job applicants. In a pile of black-and-white sameness, sometimes the use of color, humor, and creativity can stand out and show a candidate as a creative thinker and leader. Ensure the links work on a variety of computers and web browsers. Have multiple resume versions prepared. A clear version in Word with a simple font is essential for uploading to online applications. Keywords are important, and you should know that automated HR screening programs hunt for specific words. You may need to try different styles until you find one that has success. If your resume is not resulting in interviews, change your style rather than continuing to send out one that is clearly not working. Most importantly, it is vital that your resume reflects your personality rather than being a copy of a clever resume that worked for someone else. The beauty of a good creative resume is that it shows fit, but that fit has to be accurate and based on the individual. Ask for help in your school’s career center. Career services professionals can help you move forward and use these new tools while also adapting and growing our own skills and knowledge. Go forth and cultivate creativity! Kathy Anderson is an employer relations and cooperative education coordinator at Drexel University, where she works with students in the Antoinette Westphal College of Media Arts and Design. Michelle Mignot is a cooperative education coordinator at Drexel University, where she works with students studying computer science, digital media, and product design.